"Don't You Feel It? Anger and Frustration Are Everywhere"
"Insurgencies are easy to make and hard to stop. Only a few ingredients need to combine to create an insurgency; like oxygen and fire, they're very common and mix all too often. The recipe is, simply, a legitimate grievance against a state, a state that refuses to compromise, a quorum of angry people, and access to weapons." From time to time we get a few responses to our weekly column. Some are well thought out, others not so much. Some register agreement, some disagreement and some are very emotional about an injustice. Mostly we hear of injustices inflicted on rural landowners for obvious reasons being that we are ADVOCATES for rural landowners. "You have got to be kidding. 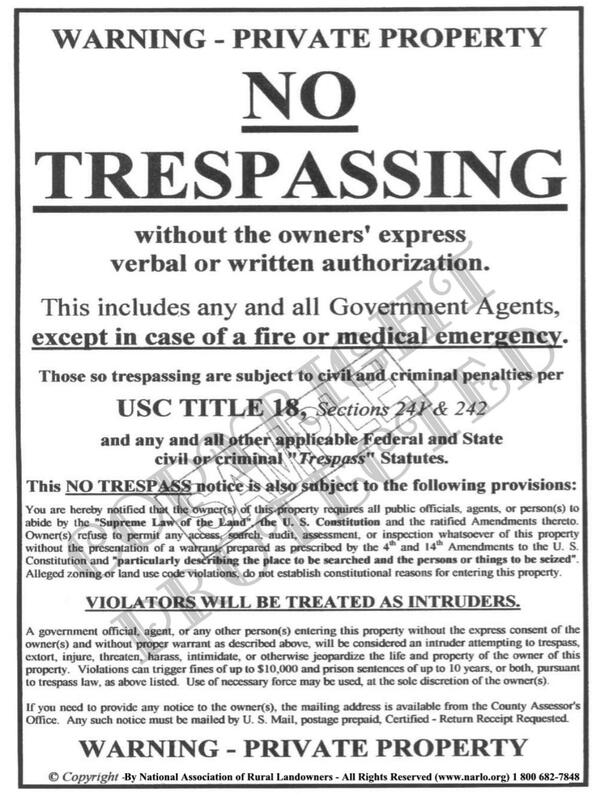 As a small land owner who is working on a special project I am constantly looking over my shoulder, waiting for a confrontation with the county bureaucrats regardless of their lack of acknowledgment of your No Trespassing sign that I have posted on the entry gate. The real problem with my feeling for a lack of freedom is my excessive gain in anger and readiness to do battle. So, with that said, and as I think back when I was a young lad of 14â€”15 in 1954/55 as compared to now, my loss of freedom is insurmountable and impossible to regain with out a fight, and not a good fight at that." "Thanks for sharing your frustration. You are angry and tens of thousands of other Americans are angry. Some are even fighting mad. But the reality is if you take up arms against the government by yourself, you will be put down and become a martyr. There are simply not enough angry people in America who have the leadership, men, materials, money and the courage to take on the federal, or even the local government. Look what the FEDS did at Ruby Ridge and Waco. Look at what almost happened at the Bundy ranch in Nevada in April of 2014 when over 200 heavily armed BLM agents came up against about 400 armed civilians. It could have become a blood bath on TV for all to watch and many would have died. Faced with the abundant publicity, the government reluctantly backed down." "Unless there is a massive uprising, especially in the West where most of the rural injustices are happening, nothing is going to change, except more people getting angry, but feeling helpless to do anything about it." Our last article entitled: "Urban Dwellers Won't Save America, They'll Destroy It" we chronicled why rural landowners are the key to saving America and the efforts by big city-states to repeal the Electoral College. The call for the repeal of the Electoral College is echoed by many on the left especially those in big cities. Ms. Reid forgets that America is a Constitutional Republic, not a Democracy and those rural Americans she despises grow the food she eats. So many are angry in America. The big city folk are angry at the rural folk and the rural folk are angry at the big city folk. Constituency groups are angry with other constituency groups. The black and Latinos are angry at the whites, or each other. Black NFL players are now angry at the NFL because under new NFL rules they can't kneel when the National Anthem is played at national football games. Rural landowners are angry at all of the rules and regulations they must follow in order to raise our protein, wheat, vegetables and fruit that we all consume. Environmentalists are angry with rural landowners because of the alleged environmental degradation they cause. Millions of Americans are angry at the nationalization of the nation's health care under Obama care. Millions more are angry at government policies that act as magnets for illegal aliens to invade our country and burden our already over-stretched welfare systems. Most of America is angry with the burgeoning national debt, but no one will lift a finger to stop it, Democrats, Republicans or Independents, whether politicians or civilians. Just yesterday we learned that the FAA has dumbed down the test to become an air traffic controller in the interest of diversity and political correctness. It seems someone in or outside of the FAA (probably Obama) decided there were too many white people in air traffic control so they "corrected" this "tragedy" by looking for those of color, play sports, those without jobs, or those who don't like science. They weeded out the competent ones with a biological test right from the beginning. Pilots get a low grade and aren't hired. What!!! What does diversity and political correctness have to do with competent air traffic controllers? Nothing!!! So ladies and gentlemen it isn't the most competent that are guiding your airplanes in a crowded sky, it is the most diverse, or the most unemployed, or basketball players, or those of color, or those who don't like science. This isn't bad government it's insane government. If you ain't angry by now, you never will be. In contrast to the above landowner's response to "How Free Do You Feel", we received another response from probably a big-city American stating: "I am not talking to you because you are a conservative. Conservatives think that everyone should be responsible for them selves and they want government out of their lives. Don't they realize how selfish they are being? Why should people be responsible for themselves when we have such a huge wonderful government? The government knows what's best for us and government should redistribute our wealth accordingly." We know what you are thinking; that this was a put up job, but unfortunately it is a real response from a real person. We couldn't believe it either. The naivete' and stupidity of this ignoramus is almost indescribable and it made us really angry. Still, it is a disheartening manifestation of what has happened to this country in the last 80 to 100 years of generations of government give-away programs that reward people for doing nothing, in return for a vote to keep the government "givers" in office, a political strategy that the Founding Fathers warned us about many times. It also represents what teachers are teaching in our public schools and colleges. Sadly, America has become a nation of way too many whiners, losers, takers, victims, addicts, mental cases, money grabbers and illegal aliens and they all seem to be angry at the producers and achievers and they all want something for nothing. Now of course, those with their heads in the sand, or addicted to violent entertainment, electronic devices, drugs and alcohol, live in a bubble where reality doesn't penetrate. They aren't angry they're stoned. If you aren't scared for you and your country, you just don't get it. Are Americans going to take this injustice and unconstitutional dictates from our government? Are we going to just sit there and let them steal our money so that they can buy votes from people who don't work for it? Are we going to let them sell our sovereignty to the central bankers? Are we going to let them do nothing about illegal immigration except grant the criminals amnesty so that the criminals will vote for the politicians that granted them amnesty? Are we going to let government put the least competent air traffic controllers in charge of our commercial airplanes for diversity's sake? Are we going to let government become hopelessly corrupt? Are we going to let government take over our health care? Oops! They already are and have. Are we going to let socialist and environmental lobbyist organizations take over this country by subterfuge and corruption of our political process? Are we going to let the Federal Government set the curriculum for our public school children and indoctrinate them to become good little socialist, mindless robots? Are we going to let high-paid lobbyists with hidden and narrow agendas, control what laws get passed in this country, like we have for 100 years? Are we going to let our courts render decisions that fly in the face of our Constitution and natural law? Are we going to let the lawmakers take away our rights, one by one, and enslave us? Rural landowners are getting fed up with this crap even if city folk aren't. Perhaps they don't need guns, or the Electoral College to have a voice in the political process. After all, they own most of the landmass of America and produce literally all of the food we eat. If rural landowners held off delivery of their product to the market for just one week, they could bring the entire country to its knees. The wheels of commerce would stop and there would be riots in the streets as grocery store shelves emptied. Maybe then, the dependent urbanites might show a little more respect to those they owe their very lives. They might just turn on the radical environmentalist that gets in the way of food production and adds to the rising costs of everything. The land and food are the most powerful leverage of all and rural landowners corner the market. Rural landowners are usually well armed and they learn how to use weapons at an early age. Our organization (NARLO) stands with the rural landowner and understands their deep anger and frustration. It is our goal to "EMPOWER" rural landowners. If you aren't a rural landowner, it might be a good idea to go out to the farm or ranch one day and see how real people live. Farming and ranching are back breaking work and they get paid so little. They do it because they love it. Right now, rural landowners are very angry and for good reason. Their anger could very well turn into action ..... without ever firing a shot. Who knows? Maybe rural landowners will be the next American insurgency.